I’m a university lecturer and during the teaching year I almost always have a fountain pen, often a Lamy Safari or Lamy AL-Star, in my shirt pocket. But there’s a problem over the summer – I wear t-shirts and I don’t have a shirt pocket for my pen. My Safaris will clip on to the neck of the t-shirt, but it pulls the neck out of shape. Solution: the Lamy Nexx. 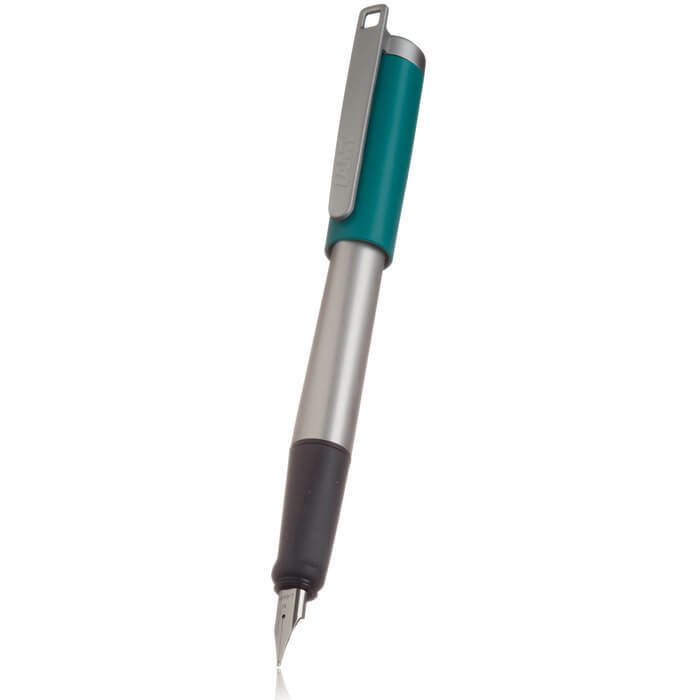 Same nib, same basic feel, but including a clip with a hole at the top, that allows you to hang the pen from a lanyard. The people at The Pen Company were kind enough to give me a Nexx M to try, and here’s my opinion. The Nexx M is made from a combination of aluminium (barrel, clip), hard plastic (cap, section) and a rubbery coated hard plastic (grip). The nib is steel. The cap plastic comes in a number of colours – the one I was given for this review is a near-black charcoal colour. The M is a slightly-upmarket version of the standard Nexx, which is identical except for a cap and clip moulded from one piece of plastic. The Nexx M looks somewhat more formal than the Nexx; collar and tie rather than open-necked shirt? 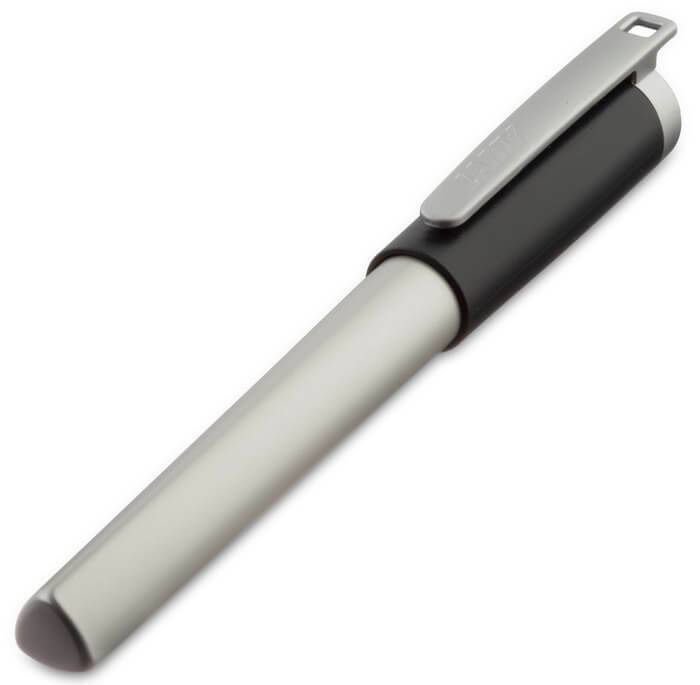 The fit and finish is of a high standard: the brushed aluminium finish is smooth, there are no externally-visible moulding lines on the plastic parts, and the cap clicks on and off positively but without the need to wrestle with the pen. There is a small moulding dot at the centre of the cap top, but it doesn’t detract from the way the pen looks. 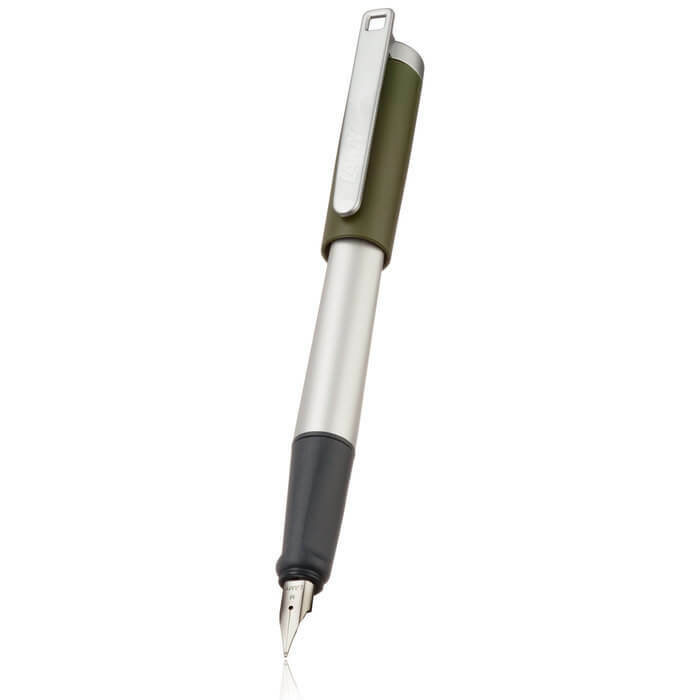 Open the pen by pulling the cap off, and as well as the rubber-coated grip you’ll find a standard Lamy steel nib, familiar to the users of Safaris, AL-Stars, Accents and others. My pen was fitted in the shop at Hitchin with a fine (F) nib to replace the medium (M) it came with. This is Lamy fine, not a Japanese fine, so expect something a little wider than you might sometimes expect, although not as wide as Pelikan nibs tend to be. You can opt for a Lamy extra-fine (EF) nib, but even that doesn’t give the thinnest line in the world. Being the ‘standard’ Lamy fitting, changing nibs is easy for the user and spare nibs are easily available and cheap, although you can fit a Lamy gold nib which costs four times as much as the pen. My Nexx M came in the standard way – one Lamy blue cartridge in the barrel but no converter. The cartridge is Lamy-specific but at least one manufacturer (Monteverde) produces compatible cartridges, or you can fit the Lamy Z24 converter that also fits the Safari, which latches securely into the Nexx with two tabs in just the same way. Alternatively, you can refill an empty cartridge with fountain pen ink from a bottle using a blunt syringe; in my experience, you can get a good number of refills from an old cartridge without it breaking. Lamy blue ink is one of the best-behaved inks I know – it flows well, the colour is calm if unspectacular, and it doesn’t spread – even on the photocopier paper we use at work. I bought a bottle of it for use in other pens. So I decided to test the pen using the cartridge it came with. First, though, it’s worth running the nib under the cold tap and drying it on a tissue to remove traces of the blue ink used at the factory to test the pen before dispatch. 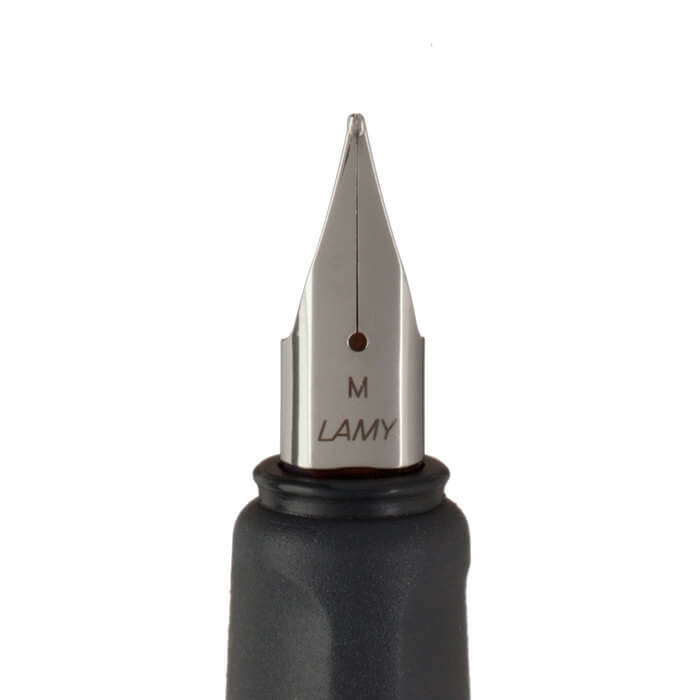 Those of you who have followed the discussions on the Lamy Safari on the Fountain Pen Network and elsewhere, will be aware of the strong differences of opinion which the grip of that pen provokes. Some people love the triangular shape which forces the fingers into the “correct” position on the pen, and its sharp edges which dissuade you from holding it any other way. Others state in no uncertain terms their dislike for the design. A real Marmite of a grip – love it or hate it, with little in between. The Nexx M has a toned-down version of the same grip. The edges are rounded, and the rubbery coating makes the experience more comfortable and less dirigiste. There is a cost, though; like all rubber grips, the feel of the pen in the hand is less precise than from a hard grip, although this effect is only slight for this pen, and I haven’t had the pen long enough to see how well the rubber lasts in the long term. Overall, the Nexx grip is perhaps a Seville Orange Marmalade: love/hate, but not as extreme as Marmite. Using the supplied Lamy cartridge on Clairefontaine 90gsm paper, I was a little disappointed at first. The pen felt slightly scratchy and the flow of ink to the tip was rather meagre, resulting in a weak line. Not what I’d hoped for. An examination under a 10x loupe revealed that the left tine of the nib was slightly lower than the right, a difference too small to see under the naked eye but enough to disturb the path of the pen over the paper. A little upward nudge of the errant tine with my thumbs (which also pushed the tine outwards a little and so increased the ink flow slightly) and a recheck under the magnifier, and the feel on the same paper was perfect for me – a slight tooth to remind me why I enjoy using a fountain pen, and a good but not too generous ink flow, enough to show nice shading of the writing which flattered my ghastly writing. This is a very personal view of a fountain pen from somebody who has, and uses, a fair number of them, new and vintage. The rubberised triangular grip of the Nexx M makes this pen feel different from any other I have, and makes a comfortable change from my Safaris and AL-Stars. Would I buy one? I would have done exactly that, but for the generosity of The Pen Company. Would I continue using a pen I was given for a review? I will have it hanging from my neck on a lanyard this summer. A definite keeper! Paul is a university lecturer with a passion for fountain pens, which he uses daily. ← Previous Post: Why is Adult Colouring So Popular?